THIS FLASK IS GIGANTIC! This very large 64oz flask features a genuine leather wrap that goes all the way around the flask. This HUGE novelty flask is the closest thing to "Made in the USA" as you can get with hip flasks. The teal textured genuine leather has a unique pattern embossed directly onto the 100% genuine leather. This is a great flask made with high quality stainless steel and premium quality leather. The 64oz size holds 1/2 gallon of your favorite alcohol The leather is thick and hearty and will never come off the flask because it is permanently bonded using industrial strength adhesives. 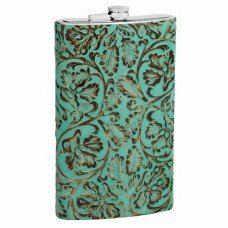 This 64oz genuine leather hip flask features a textured leather with swirls of teal color that is created right here in the USA from cows raised in the USA on feed produced in the USA. The wrap is applied by hand to the solid stainless steel flask by USA workers in USA facilities! Buying this flask helps support the US economy! Although we offer free custom laser engraving on this leather flask many buyers opt not to personalize the flask so that we do not interfere with the "look and feel" of the flask.